When looking for an affordable, natural solution to my teenage blemishes, I first turned to the brand Desert Essence. It caught my attention, as it was one of the few skin care lines carried in Trader Joe's. 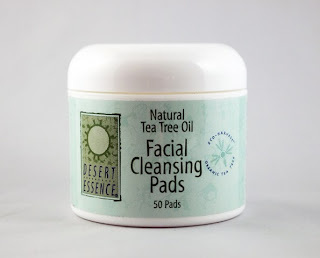 While my usual grocery store changed when I moved, I still seek out products such as their Facial Cleansing Pads at local health food stores. Read on to find out why. After many years, I have found Desert Essence to be an affordable, readily available, and gentle solution to my occasional blemishes. The Facial Cleansing Pads are no exception. I love how they stay moist almost indefinitely in this tight-sealing jar. I use them as a toner, and only add the blemish treatment if I'm dealing with a more intense breakout. The tea tree oil mix stings lightly, but the effect goes away quickly and this product really works. The pads are also gentle, with the current formula rating a low 2 on EWG's Skin Deep database. I enjoy the convenience of the pads - no dumping toner onto cotton pads and no spills. When I travel, I take a few in a zip-top bag, as the container is a little bulky for travel. If you're looking for a convenient, effective toner and treatment for blemishes, these pads are a great option.